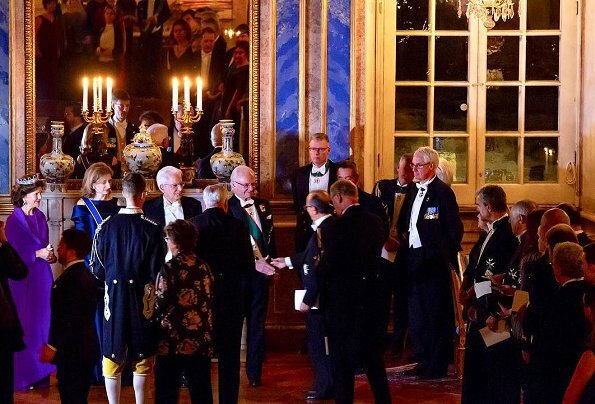 In the evening of November 13, 2018, King Carl Gustaf and Queen Silvia of Sweden hosted a state dinner at Stockholm Royal Palace, held in honour of Italian President Sergio Matarella and his daughter Laura Matarella. 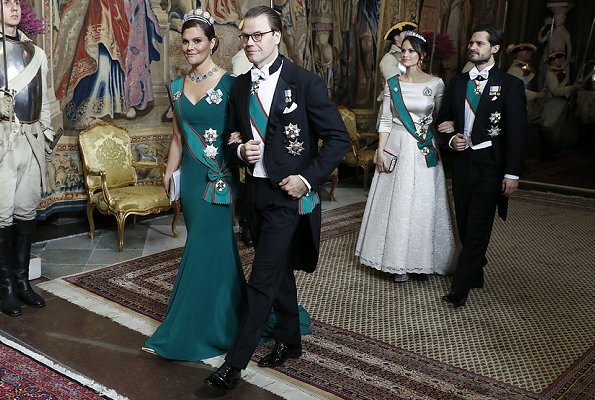 Among the attendees of the state dinner, there were Crown Princess Victoria, Prince Daniel, Prince Carl Philip, Princess Sofia and goverment representatives. 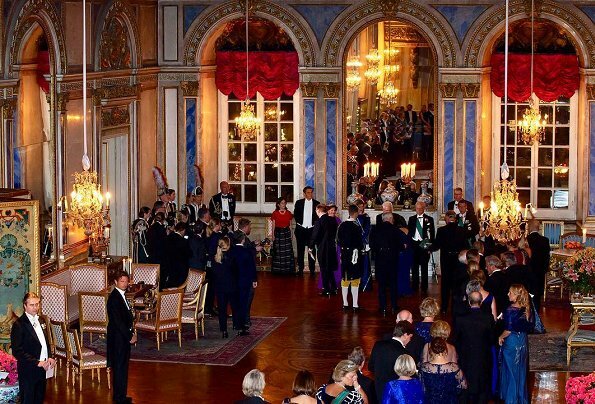 Italian President Sergio Mattarella is currently making a State visit to Sweden as the guest of the Swedish King. 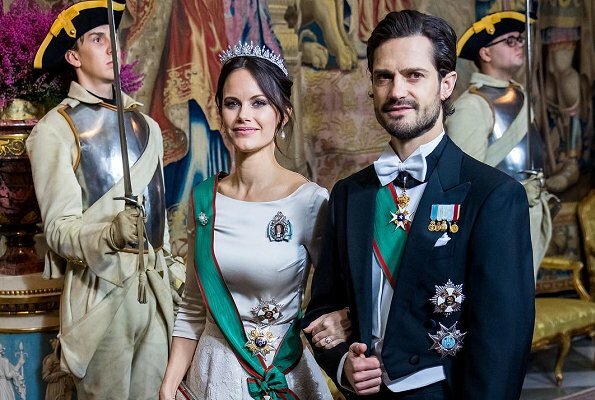 Love these Gala Robes.Beautiful colors and style.I see Victoria Daniel Carl Philip and Sofia received the Order of Italy. Everyone from The SRF has enough Hardware on their chest. This must be Sofias 2nd one. 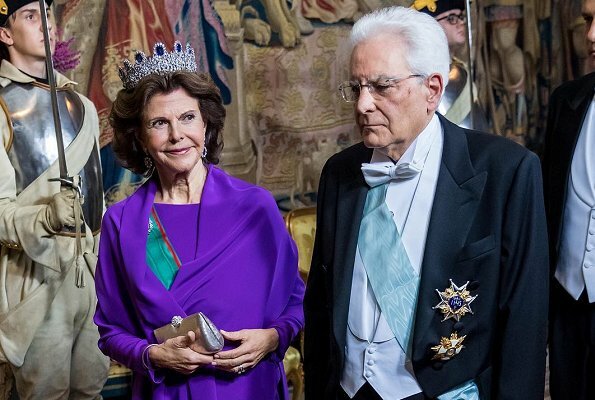 Also love the dress of the Italian First Lady.And what great jewels. ..."enough Hardware on their chest"... ha ha ha! Thank you for this great comment! Laura looks beautiful;that particular blue dress is quite striking. The Royals may be adorned in all of the jewels but somehow they look tacky. The Royal ladies dresses look nice. Given the bright green sash of the Royals, I would prefer emeralds for the Queen and amethysts for Victoria. Sapphiers look too dark and not their best with bright purple and bright green, and Victoria's lovely dress will really stand out with the amethysts. Love all the dresses except Sofia's, it doesn't look like a good fit on the top. Sofias dress is illfitting, too tight.. Even though the style is a bit boring, and those caps on the sleeves look outlandish, I like Victoria's dress. The cut and shape of it fits her perfectly and that's what matters to me. It could have been a nicer green for evening too. Nice necklace; tiara not so much. Is everything allright with Sophia? She looks a bit tired. Maybe it's just the (wrong) color of her dress. I don't like the top of Sophia's dress. The fabric is to soft and shows to many wrinkles. Victoria looks phenomenal, this is an incredible gown & color on her. Sophia's look is missing something to make it a bit more modern, it looks a bit matronly. One of Victoria's best ever! Perfection! Victoria and Sofia look fab, fab, fab. and the man :-) so handsome! Purple is always a good color for Sylvia but there is not much style to it. Sophia looks washed out in this ivory color and the skirt part of her dress is quite old-fashioned. Love the dress of the Italian President's daughter (Laura), beautiful color. The color and style of Victoria's dress is also beautiful on her and makes her looks so slim. These two ladies are wow! Agree with everything you say here. I think the pale colour is what makes Sofia look rather pale and tired. She looked great in the bright blue dress earlier. Victoria's dress is gorgeous. I love the colour and it looks superb on her. Silvia - wonderful again. The winner outfit. Nice color. So classy. One of the best tiaras! Laura Matarella - wonderful color. The top part is So weird though.it ruins everything. Victoria - nice outfit but i would like the diferent shade of green. Nice anyway. Not the best looking tiaras in my opinion. Sofia - nice top and skirt. In one of my favorite colors. Im not sure what to think about Her tiara, it looks like a bunch of prickles coming put of Her head. And same tiara again. Silvia - excellent dress. The wrap covers too much of it though. Sofia - too bridal. Nice silhouette, bodice´s fabric to soft/stretchy to sit right and hold her orders. Skirt length looks wrong (either floor length (5cm longer) or maxi (5cm shorter) like on the model. 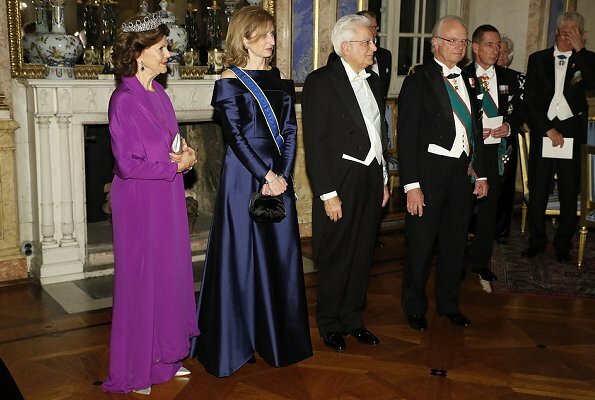 Laura Mattarella`s dress has a gorgeous colour and works great with the sash. The top is a bit weird, but it´s a good look overall. My favorites are Victoria and Laura Matarelli. Sofia has very nice hair. Even though I preciete Victoria's strong ow style, but I would love to see her sometimes with this kind of loosen hair as well. Sofia's dress is illfitting. Silvia's dress looks messy and the colour looks cheap. Victoria is gorgeous! I love Laura's dress. I can't comment on Silvia's dress because she is too covered up. All I see is purple fabric. Sophia missed this time. The bodice is too lightweight for her orders, and the skirt is the wrong length. I think it would have looked better as a midi. 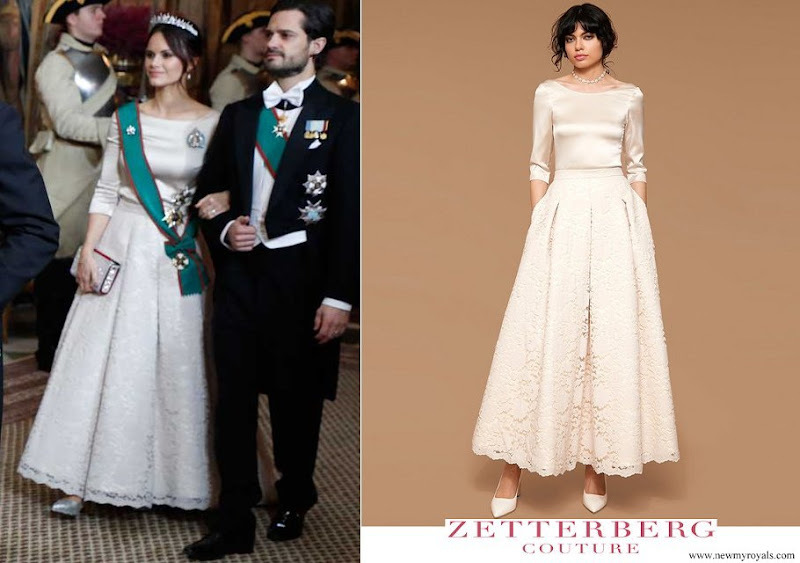 Victoria's dress is perfect and Laura Mattarella also choose wonderful one in colour and shape. Sofia's gown is beautiful but it's a bit plain, I think a necklace and earings in strong colours would make her look georgeous. Love the jewel colours especially of Victoria's dress. Not keen on the top of Laura Matarella's but the colour is lovely. I don't mind Sofia's dress but it's a bit underwhelming beside all the bright colours. Why the queen has no sash? She has. It's just barely visible because of her shawl wrapped around her. My preference here it´s for Victoria look, I like it very much. 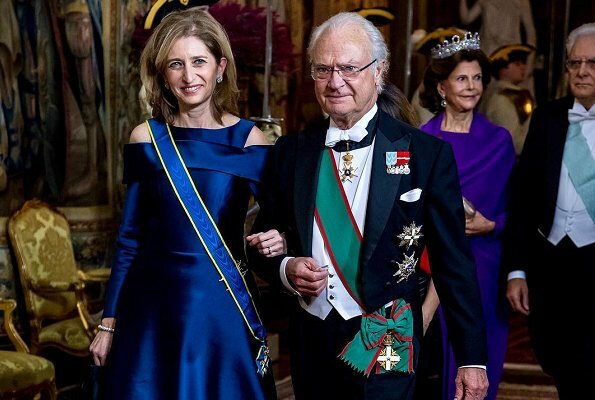 Does the Swedish royal family not have more tiaras? I've only ever seen like 4 or 5 tiaras that the ladies always wear. The one Silvia has on, an aqua blue sapphire one Madeleine likes to wear, a dark blue sapphire one, the "6 button" that Victoria is wearing and I believe one called the "Baden fringe". There's also the one Silvia and Victoria wore when they got married. 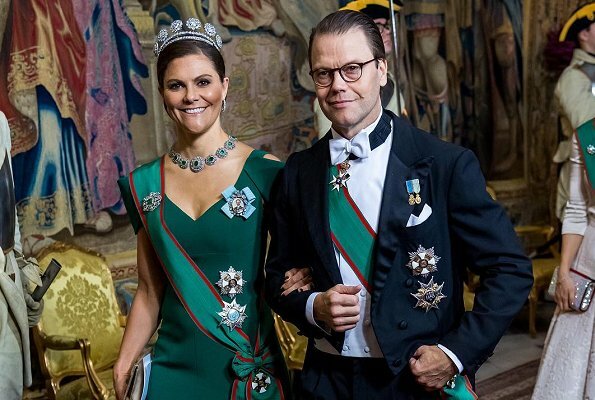 Sofia always wears her wedding tiara which she had modified so she could wear it with emeralds or pearls. If they have more I think it's time to bring them out of the vault. 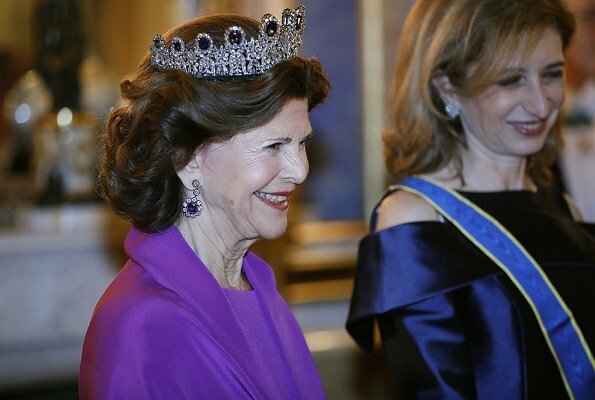 Actually Swedish royals have one of the best tiara collection in the word. And most of their tiaras are also very old. They have at least 19 tiaras total if we count also those own personally. 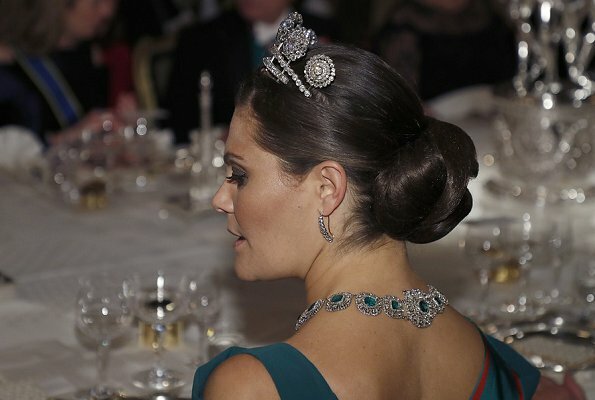 The Leuchtenberg Sapphire Tiara seen here is second most valuable, biggest gun is Braganza Tiara. Then they have what is called Nine Prong Tiara, delicate Connaugh Tiara, very old Cameo Tiara, Edwardian Ruby Tiara, Napoleonic Amethyst Tiara, Baden Fringe Tiara, Modern Fringe Tiara what is actually Edwardian, Two Napoleonic Steel Cut Tiaras, Aquamarine Kokoshnik Tiara, Victoria has Laurel Leaf Tiara, there are these Four Button Tiara and Six Button Tiara (these buttons are from Napoleonic era and from Queen Ulrika who died 1741, so VERY old diamond buttons), Sofia has this convertible Emerald-Pearl Wedding Tiara, there is also Cyclope Aqua Tiara (very ugly!) and Victoria had a tiny one as a practising tiara + there is one I have never seen just saw Victoria got it from Lilian. Most of those tiaras are just tiara but a whole parures of very old and valuable jewels. I did not like button tiaras at once, but I have somehow grown to like them when knowing how old and valuable those buttons really are. I think that Sofia's gown is classically beautiful and would have looked perfect if the bodice hadn't been pulled around by the heavy jewelry. Agree that Victoria's dress is a beautiful color, elegant and very flattering; the button tiaras are never a great choice, though (imo). CP Victoria wins. She had everything perfect. Victoria looks SO stunning, one of the best evening gowns she has ever had. Nice to see also that Napoleon time emerald necklace out. In her first pic Sofia looks very beautiful, in other pics not so much. Silvia´s gown is disappointment to me. They have more than 20 tiaras to choose from. If you look back about 5 years, they all been used. Some tiaras are only used at special occasions, some is reservated for the Queen, some only used abroad, It has to do with traditions and so on, but they are all used. The king also have 3 sisters who have access to the royal tiaras. Sofia has worn 3 other tiaras than her personal the recent years. Das schönste Kleid , in Farbe und Stil hat für mich die Königin : das Diadem Leuchtenberg glaube ich , ist das herrlichste überhaupt, finde ich !! Laura Martarella - eine Augenweide im eleganten blau ! !